Tas Kelp is an exciting local Island business started by Kelli and Steve Lane to promote the uses of Bull Kelp. TasKelp market environmentally friendly products under the Tas Kelp brand. We are based in the North West of Tasmania and source the best quality kelp from the shores of King Island to the West Coast of Tasmania. Spending 23 years on King Island and 15 of those years carting kelp on the beaches. 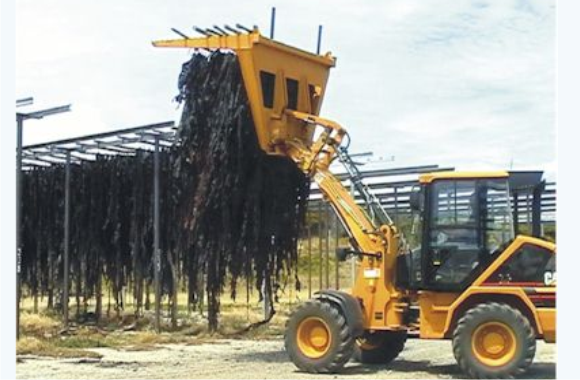 Bull Kelp (Durvillaea potatorum) is collected by Kelp harvesters from clean, unpolluted waters around Tasmania and King Island. The Kelp grows to a spectacular 8m. During a storm, kelp is torn from the rocks and cast on the beaches. Kelp can live 14 years or longer and can grow at the rate of 10-14 cm a day. It does not have flowers, seeds or roots like other plants. Instead, the plants fix themselves to rocks using a root-like structrue called a ‘holdfast’ to stop it from being swept away. Some kelp plants can be found washed up on the beach after storms. Bull Kelp form the basis of important ecosystems. It grows in large groups called ‘forests’ that become important nursery areas for many species. Bull Kelp is a good source of trace minerals that well-up from the bottom of the sea. It is harvested for use in natural medicine, as a fertilizer and feed in aquaculture. Aboriginal people in Tasmania used dried Bull Kelp to transport water and food. The species name came from this use: potatorum means ‘to drink’ in Latin. Climate change threatens the growth of Bull Kelp, even small increases in water temperature. Kelp from the shores of King Island is air and solar dried followed by wood fired oven at temperature up to 75 degrees as a final milled moisture content of around 12 – 15 percent. Kelp is delivered to the factory by truck or trailer, where the fresh weed is hung by hand onto low purpose-built unloading racks. The weed is lifted onto high racks to dry naturally in the sun and wind before being moved inside for completion of the drying process. The dry kelp is fed through a hammer mill to reduce it to the required granular form and size. The final product is packaged into reusable one tonne bulk bags. The product may be transferred into 20kg sacks or bulk loaded into sealable shipping containers. It is crushed into granules, and then shipped in containers to Scotland, where they extract the alginates. We use alginates everyday in products such as ice-cream, drinks, salad dressings, detergents, toothpaste, paint, paper, pharmaceutical and cosmetic products. It has been tested for any heavy metals: any detected were 2,700 times below levels accepted by the World Health Organization.